I'll be the first to admit that it's difficult to get excited by a smartphone mount. It sticks to something and holds your phone--whoopie. But I've been using iMagnet's $25 iMagnet Mount for Smartphone for a while, and I'm impressed. Instead of a standard rubbery suction cup, the iMagnet mount uses a sticky, silicone-gel cup that stays on remarkably well and, in my testing, attaches to more surface types than regular suction cups. The mount doesn't leave a mark when you remove it, and you can wash the gel surface if it gets dirty to restore its Dyson-like suction power. The mount worked equally well on the windshield and dashboard of my car, as well as on my kitchen counter and cabinets. The iMagnet gets its name thanks to a magnetic slab on the mount end--which means that for your phone to stick, it needs some metal. The smartphone mount kit comes with a small metallic disc that you can place between your phone and its case; as well as two thin, rectangular, metal plates with 3M adhesive that you can stick to the back of your phone or case, or even inside the case--the idea is to use whichever method is easiest. I initially tried the disc, inserting it between my iPhone 5 and its silicone case, but the disc would often slip down towards the bottom of the case, making mounting more difficult. I then switched to using one of the plates, which I adhered to the inside of the case so as not to leave any residue on my iPhone. I found that approach to work much better, since the plate is both a larger metal target for the magnet, and it doesn't move. Popping my iPhone on and off the mount is easy as pie. The phone snaps into place with a sturdy connection, but a gentle tug is all it takes to remove it. 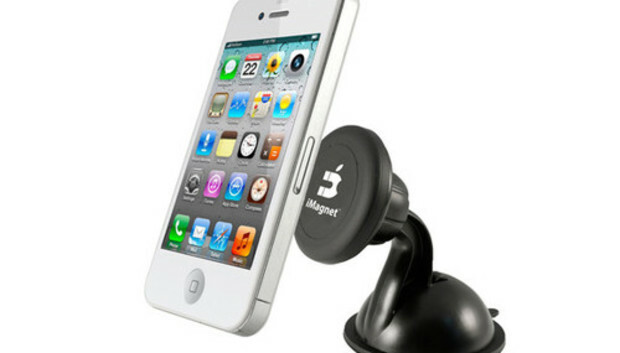 The magnet itself connects to the mount using a rotating ball socket that lets you adjust the position of your phone; when you get just the right orientation, a plastic screw cap locks that position. One concern I had was whether a big magnet would cause any interference with GPS driving directions, but after a month of using my iPhone with the built-in Maps application while mounted on the windshield, I found no problems with navigation. Although I tested the iMagnet mount with an iPhone 5, the mount works with many other makes and models of smartphone. I wouldn't consider that to be a complete list, though--the company says the mount works with any device that weighs eight ounces or less. Other companies have recently announced similar magnetic mounts, so keep in mind that iMagnet isn't the only game in town if matching ferrous objects is your mounting method of choice. But the iMagnet mount's grippy gel mechanism and strong magnet make it a great choice for those who want something that's easy to attach your device and keeps it securely in place.